RIPv2 is an old Routing Protocol but it is the first Routing Protocol that all Network Engineers meet first. In this lesson, we will configure RIPv2 on Huawei Routers. For our Huawei RIPv2 Configuration Example, we will use the below topology consist of three routers. Here, indirectly connected networks will be learned via RIPv2. 1) Interface configurations of the routers. 2) RIPv2 Configuration on the routers. We will configure the Router interfaces as above IP addresses on the topology. On each router, we will configure RIPv2 with the RIP process number “1”, we will set the RIP version as “version 2” and then, we will add the directly connected networks of each router to the RIP network. Latly, we will save our configuration on each Huawei router. Hey Buddy!, I found this information for you: "RIPv2 Configuration on Huawei eNSP". 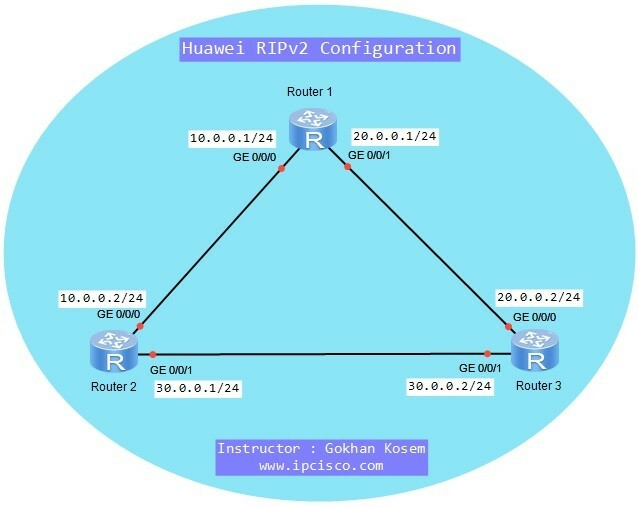 Here is the website link: https://ipcisco.com/ripv2-configuration-on-huawei-ensp/. Thank you.